Vitamin B12: What Form Is Best? In dietary supplements, vitamin B12 is usually present as cyanocobalamin , a form that the body readily converts to the active forms methylcobalamin and 5-deoxyadenosylcobalamin. Dietary supplements can also contain methylcobalamin and other forms of vitamin B12. Existing evidence does not suggest any differences among forms with respect to absorption or bioavailability. However the body’s ability to absorb vitamin B12 from dietary supplements is largely limited by the capacity of intrinsic factor. For example, only about 10 mcg of a 500 mcg oral supplement is actually absorbed in healthy people . 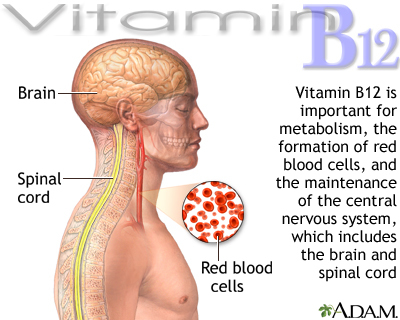 In addition to oral dietary supplements, vitamin B12 is available in sublingual preparations as tablets or lozenges. These preparations are frequently marketed as having superior bioavailability, although evidence suggests no difference in efficacy between oral and sublingual forms [16,17]. The Institute of Medicine (IOM) recommends that adults older than 50 years obtain most of their vitamin B12 from vitamin supplements or fortified foods . It would be difficult to take too much vitamin B12 … 3,700 micrograms/day appear to show no risk. And the body has a number of ways to get rid of a large dose. This entry was posted in Uncategorized on April 15, 2017 by Bix.